Pari is learning to love Jesus at her new school. The currency of India is the rupee. About 68 rupees are worth one US dollar; 72 rupees are worth one euro. While Hindi and English are the two official national languages, the people of India speak hundreds of languages and dialects. To Sabbath School teachers: This story is for Sabbath, Aug. 12. Click here for photos to share while telling the mission story. Pari is 9 years old. Recently Pari learned that her name means “one who is holy.” It happened when she enrolled in an Adventist boarding school. 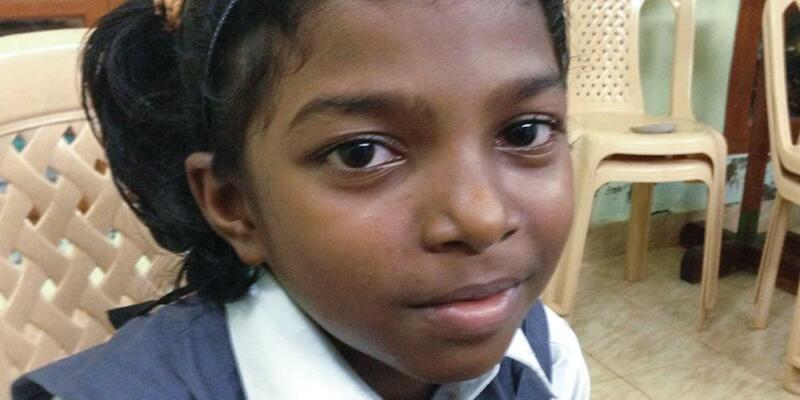 Pari hasn’t been a student at her new school for long, but she’s already learned to love Jesus. She loves reading her Bible, and Psalm 23 quickly became her favorite Bible passage. Pari smiled shyly as she recited the psalm from memory. “The Lord is my shepherd; I shall not want,” she said in her native Tamil language. “He makes me to lie down in green pastures; He leads me beside the still waters.” Pari paused partway through the recitation, her bashfulness causing her to forget the words. The school principal, who sat nearby, gently prompted Pari. Pari knows what it means to walk through the valley of the shadow of death. Her father, a truck driver, was killed in a road accident when Pari was just a toddler. Sometime later her mother abandoned her, leaving her in the care of her grandfather. Pari and Grandfather live in a little hut, and they have managed somehow. But Grandfather wondered why so many bad things happened to him. He wondered whether anyone heard his prayers. As he sought peace and answers to the reason for so much sadness, his daughter, Pari’s auntie, told Grandfather about Jesus. Auntie is an Adventist, and she told him that Jesus always hears prayers. Grandfather is getting old, and his eyesight is poor. He has very little money to support Pari. Some of his relatives suggested that Grandfather send Pari to study at an Adventist school. Grandfather agreed, and Pari enrolled in her new school, which is more than an hour from her grandfather’s little home. When Pari was asked if she likes studying at James Memorial Higher Secondary School, Pari smiled brightly. Yes, she loves her school, and she loves having so many new friends! She lives in the girls’ dormitory, where she now has 100 sisters. It doesn’t matter much to Pari that the dormitory is old and the rooms are crowded and perhaps not as healthy as they should be. She’s just glad she can live and study at such a good school! Pari is learning to love Jesus at her new school. Recently she learned that her full name, Parisudha [pah-ree-SHOO-dah], means “one who is holy.” She is glad that she is learning about Jesus, who wants her to be His child. Please remember Pari and her James Memorial Higher Secondary School in your prayers and when you give Sabbath School mission offerings.